A lacquered wood box and sleeve cover of octafoil shape, the top and sides inlaid with tiny pieces of mother-of-pearl. 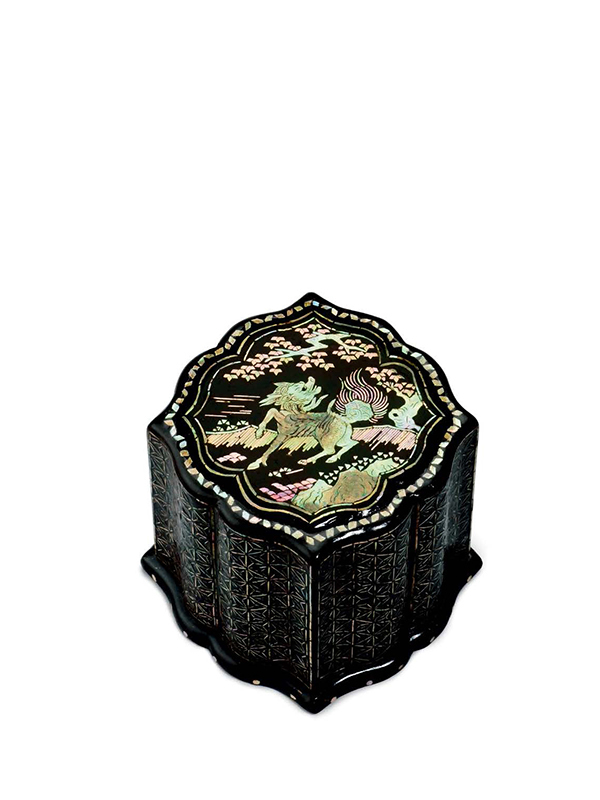 The flat lid is decorated with a qilin. The mythical, bushy-tailed animal is portrayed in the centre of a landscape with one of its front legs half-raised and his three other legs on the ground. To the right of the qilin in the background is a tree, with its branches and leaves extending toward the top of a landscape, whilst rugged rocks appear at the bottom. The sides of the box are inlaid with an intricate geometric pattern. The box is contained in an old Japanese wooden box.